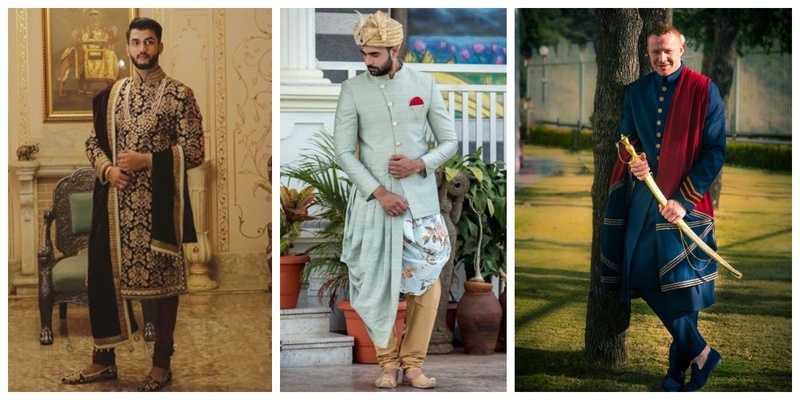 13 Offbeat & Trending Sherwanis for the Grooms this Wedding Season! While as a bride, you would have finalised your wedding outfit 1-2 months before your wedding, but what about your partner? I’m sure he would have pushed his sherwani finalisation till the last moment. But fret not, we have shortlisted a few outfits which will give you some major groom-wear inspo! This groom made a style statement in his wedding ceremony with his killing looks and royal heavily embroidered sherwani with brown velvet statement stole. Our international groom from Australia, Kurt went for a sober buttoned up sherwani with a red contrasting coloured stole.. absolutely adore the way this firang groom was able to pull off a sherwani that well. Check out more pictures of this groom & his beautiful wife here! This dapper groom Himmat who recently got had a beautiful wedding with wife Taranjot..wore a grooming brown Sabyasachi sherwani to his wedding reception..and the duo gave us major trousseau goals.. This dapper Sikh groom choose an off-white Sherwani paired with pastel pink pagdi and stole to compliment his gorgeous bride. The plain flared sherwani covered with a neatly zari embroidered jacket adds an offbeat touch to it. The additional pastel green waistband makes the sherwani look neat and classy. Another example of a dapper groom who rocked the stage with his better half wearing a flared plain sherwani with complementing light embroidered jacket. This real life royal Prince married his princess in a beautiful and sober banarasi silk sherwani complimented with a silk stole..the statement layered necklace definitely glorifies the royalty of the sherwani. Black as it is said, nails the look without any extra efforts. This handsome groom complimented his pretty wife on their reception day with a matte black sherwani. With an amazing zari embroidery on the cuffs and layered drapes in the middle, the groom definitely ruled the day. The groom’s choice of a subtle pastel green colour for the wedding outfit made this one stand a class apart. The couple coordinated their outfits with pastel shades. Picture perfect they look! This asymmetrical sherwani chosen by this groom for his wedding ceremony is simply stunning to look at. Just adore the double layered drapes falling out of the Sherwani. The floral drapes on one side and the complementing pleats on the other side definitely gives us a sense of the groom’s high sense of style. First of all, Kudos to the amazing bride and groom photoshoot. Just loved the white base sherwani with a throughout zari embroidery on it. Giving us trousseau and couple photography goals at the same time. The groom’s choice of golden sherwani with contrasting red velvet stole is complements perfectly with the bride. The extended length of the side panel gives the whole look a trendy touch. 13. This blue and golden heavy embroidered sherwani is totally drool worthy.. Loved the half n half combination of golden and blue colour mixed so perfectly in this groom's sherwani. The heavy zari embroidery glorifies the selected base colours manifolds. Sorry Grooms, with this we put a full stop to our list of trendy groom sherwanis spotted this wedding season hoping to have put some great ideas in your bucket.